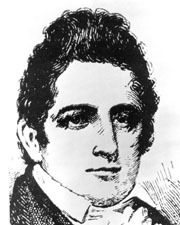 WALKER, Freeman, a Senator from Georgia; born in Charles City, Charles City County, Va., October 25, 1780; attended the common schools; moved to Augusta, Ga., in 1797; studied law; admitted to the bar in 1802 and commenced practice in Augusta; member, State house of representatives 1807-1811; mayor of Augusta 1818-1819; elected as a Democratic Republican to the United States Senate to fill the vacancy caused by the resignation of John Forsyth and served from November 6, 1819, to August 6, 1821, when he resigned; mayor of Augusta 1823; died in Augusta, Richmond County, Ga., September 23, 1827; interment in the Walker Family Cemetery in Augusta, Ga.
Mellichamp, Josephine. "Freeman Walker." In Senators From Georgia. pp. 85-90. Huntsville, Ala.: Strode Publishers, 1976.